Dunbrody | Galvins Wines & Spirits | Distributors of award winning Irish and International Craft Beers and Ciders, Small Batch Spirits and Exclusive Wines. The combination of Master Celebrity Chef Kevin Dundon from Dunbrody House and local Brew Master Kieran Bird take great pride in developing and nurturing authentic craft beers.Their Brew Master is fastidious in the pursuit of his craft and passionate about delivering beer made to the highest standards.Kieran and Kevin spend lots of time and effort honing their unique recipes, painstakingly matching natural ingredients to suit various foods and occasions. Their pride in their craft as beer makers is second to none and their pursuit of quality made crafted beer is never ending. 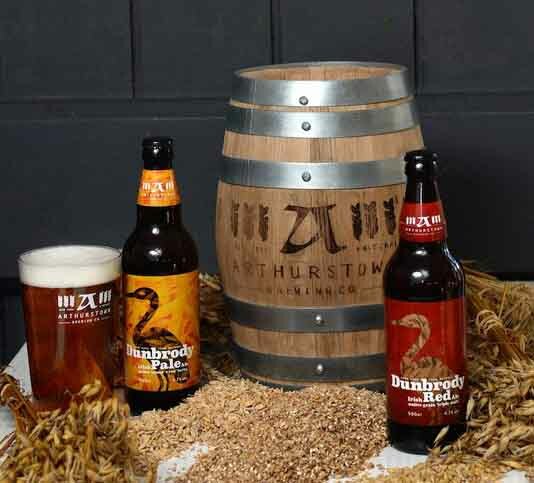 Dunbrody Irish Red Ale is made with three distinct malts – Ale, Munich and Crystal – from their own Arthurstown barley. Fuggles and Cascade hops, and spring water from the old Boiling Well on the estate. It has a rich malty flavour, with sweet caramel notes, a subtle nutty finish and a hint of sweet pine on the nose. Great with food or on it’s own ! Enjoy ! Dunbrody Irish Pale Ale is made here in Dunbrody House with American Citra, Challenger and Cascade Hops, Golden Kilned ‘Two Row’ Barely, hand rolled Arthurstown oats and water from the old Boiling Well on the estate. It has a crisp, clean taste, with fruity and floral overtones, accompanied by a refreshing hoppy citrus finish. Great with food or on it’s own. Enjoy !